A comedy action thriller, American Ultra aims for a hip and carefree attitude but has limited material to work with. In the small town of Liman, West Virginia, Mike (Jesse Eisenberg) is a laid back stoner who works at a suburban discount grocery store. He is deeply in love with his girlfriend Phoebe (Kristen Stewart), and wants to propose marriage, but can't quite find the right moment. At CIA headquarters, Agent Adrian Yates (Topher Grace) orders Mike's assassination, much to the horror of agent Victoria Lasseter (Connie Britton). Mike was part of a failed top secret program conceived by Lasseter to convert petty criminals into trained killers. Now Yates want to mop the program up and not leave any loose threads, although Mike has no memory of his training. Lasseter gets to Mike first and activates him. He is ready when the assassination team arrives, and is able to fight back. Yates locks down the town and mobilizes a massive effort to corner Mike and wipe him out. Mike has to stay alive, figure out what is going on and still find a way to propose to Phoebe. Directed by Nima Nourizadeh and written by Max Landis, American Ultra is Jason Bourne for the stoner set. The story of an efficient killing machine oblivious to his own potential suddenly tangling with his mother agency in a take-no-prisoners struggle to the death is extremely familiar. Landis gives it a comic spin with a loose, humorous vibe, allowing Mike's dopey, soft spoken, could-not-hurt-a-fly mannerisms to rub against his trained, kill-with-bare-hands abilities. The film works as far as Eisenberg and Stewart take it, and the couple stay with the material to the end, despite the plot running out of string. Eisenberg was born to play slightly bemused characters nevertheless happy to dive into the latest mess, and he makes Mike's plight worthwhile. Stewart's dark-behind-the-eyes persona is perfect for Phoebe, a woman seemingly tolerating a loser of a boyfriend but with secrets of her own. Both are surprisingly good when they spring into blood-splattered action. And that is mostly what American Ultra offers up in its second half. Once the pattern is set with Yates unleashing the might of the CIA and Lasseter doing her best to help Mike, not much more happens beyond a series of set pieces as Mike fights off the latest batch of well-armed killers and tries to inch his way to survival. Nourizadeh injects plenty of style and energy into the combat scenes, and also tries to give the antagonists some menacing personality. But Topher Grace's take on Yates is limited, and Walton Goggins can't do much with the hitman Laugher who, well, laughs a lot. John Leguizamo and Bill Pullman provide support in small roles. 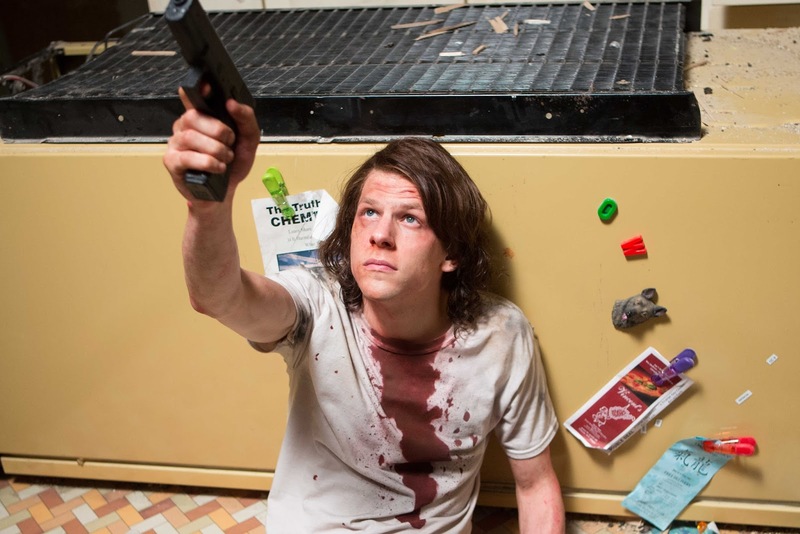 A weird combination of wry humour and hard-edged action, American Ultra is as curious as a secret agent in a perpetual haze, and just as constrained.